Eugune Moloney died in the early hours of Sunday morning after an incident on Camden Street in Dublin. ONE MAN HAS been released and another remains in custody in connection with the death of journalist Eugene Moloney in Dublin in the early hours of Sunday morning. 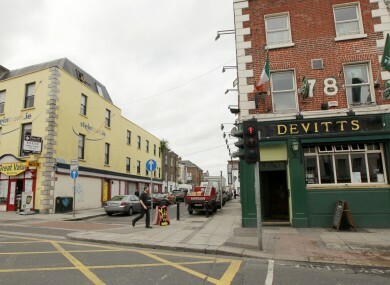 The 55-year-old died in hospital after being struck on Camden Street and falling to the ground. One man in his twenties was released last night from Pearse Street Garda Station and another man – also in his twenties – is still being detained at Kevin Street. A file is being prepared for the DPP. Moloney, a former Irish Independent journalist, was pronounced dead at St. James’ Hospital after he was found lying on Camden Street at around 4.30am on Sunday morning. He had previously worked at the the Irish News and the Evening Herald, and most recently had been working as a freelance journalist in Dublin. The family of Mr Moloney are said to be devastated at his death. His brother Sean told the Irish Independent that he was “larger than life”. He will be laid to rest in Fahan in Donegal but his funeral mass will be held in Dublin. Email “One man still held in connection with journalist's murder ”. Feedback on “One man still held in connection with journalist's murder ”.